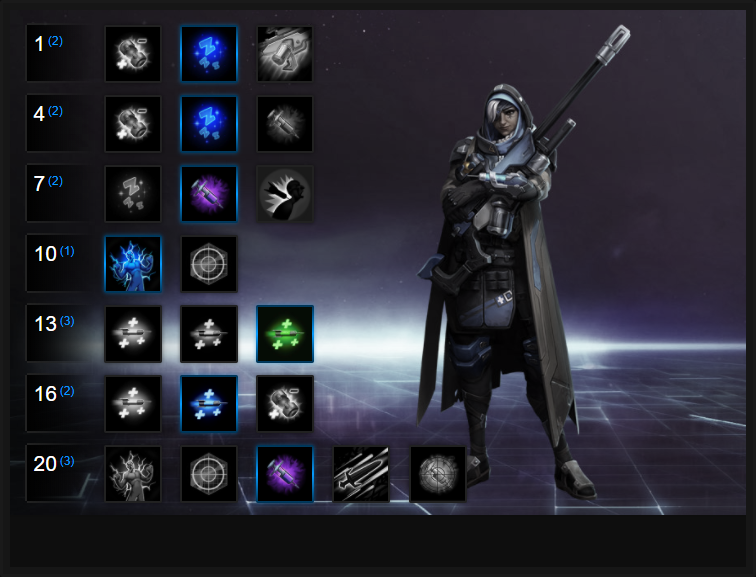 In this Ana Build Guide, we provide an overview of her strengths, abilities, talents and matchups. I think there's little doubt that Ana is undeniably one of the most fun, and strongest Support Heroes in Heroes of the Storm. With a kit that's indentical to Overwatch, she's incredibly effective in the Nexus. What's particularly interesting about Ana is the fact that all her strengths and weaknesses in Overwatch, are the same here, and that makes her a rewarding, but challenging Support Hero to play. Unlike her peers, Ana is a skill-shot based Support. She relies on having perfect aim to not only deliver healing, but to also apply her Sleep Dart and Biotic Grenade. The fact a miss with any of her abilities can be incredibly punishing leaves Ana requiring a player who not only has good aim, but one that can read the battlefield with accuracy. The fact Ana has only a minor ability to heal herself outside of her Biotic Grenade, and only one form of crowd control leaves her incredibly vulnerable to most Heroes, and if she does use Biotic Grenade for a quick splash of healing, she then faces a lengthy period where she cannot AOE heal her team, or reduce the healing of her opponent. With correct positioning however, Ana is not only difficult to pin down, but she can comfortably sustain a team and pressure her opponents. Having a basic attack range longer than most other Heroes, this puts her at an immediate advantage when it comes to poking from afar. Shrike - Shrike has two functionalities. The first is to allow Ana to apply damage over time to a single target, while the second is to stack these applications, up to a maximum of 5, for a large dose of damage over time (as well as reasonable healing). Although the damage over time is inferior to Lunara's, it's much quicker and easier to apply. Ana's increased range, combined with the speed of her shots allows her to pepper opponents with ease. Maintaining 5 stacks on a target isn't always possible, but with practice you can comfortably spread 3 or 4 across multiple Heroes for group-wide pressure. It's also important to note that Shrike will not wake a Hero who has been put to sleep by your Sleep Dart: they'll take damage, and remain incapacitated. Healing Dart (Q) - Providing an instant burst of healing from range, Healing Dart travels through minions and mercenaries and heals the first Hero it comes into contact with. The low cooldown of Healing Dart, combined with its range, allows Ana to ping heals as and where she sees fit. Unfortunately and due to the nature of the ability, if you want to heal your frontline (especially when you're sat at the back), you'll need to reposition yourself. Failing to do this will deny your Warriors important healing, and quickly see them killed. Biotic Grenade (W) - Providing instant AOE healing as well as a healing buff to all allies affected by her Biotic Grenade, increasing the healing they receive by 25% for 3 seconds. Not only that, but with Biotic Grenade denying all healing to enemies struck by the grenade, it can be exceptionally powerful when used offensively. On a Hero that's low health, it can ensure they die, as any attempts to heal them will be instantly denied. Just be sure to save Biotic Grenade for when you need to group heal, deny a pinched heal to save an enemy Hero, or for yourself. Don't just waste it for a burst of damage or healing when your rifle and Healing Dart are more than good enough. Sleep Dart (E) - As your only form of crowd control, Sleep Dart is one of, if not the most important ability for Ana. With no mobility, it's her only means of defence. With a slow projectile speed and incredibly thin telegraph, it's difficult to land against fast moving targets (especially from range). Ideally you want to save Sleep Dart for defending yourself, or for singling out an enemy Hero which your team can then collapse on. It's important to remember that any damage against a sleeping target will cause them to wake, but your Shrike damage over time will allow them to remain incapacitated while suffering damage. If you can, using Sleep Dart against a target with five stacks of Shrike not only ensures gaurenteed damage, but removes them from the fight for a significant period of time. Nano Boost (R) - As the reverse of Lt. Morales' Stim Drone, Nano Boost is designed to be used on ability focused Heroes. Restoring 200 mana, alongside a 30% Spell Power increase, and a 150% cooldown reduction, it allows Heroes such as Li-Ming, Jaina and Kael'thas to deal eye-watering damage at an incredibly fast pace. It should be noted that Nano Boost also works well on Heroes such as Valla (who can boost her Hungering Arrow and Multishot) or Sonya, who also benefits from Seismic Slam. It can be particularly powerful on Kael'thas when paired with Pyroblast, that will hit hard enough to instantly kill several low healthpool Heroes. Eye of Horus (R) - Allowing Ana to globally snipe enemy Heroes, she can fire at allies or enemies to heal, or deal damage. The damage at level 20 is fairly significant (around 380 per shot), and Ana can fire each round very quickly. As long as she has vision, she can comfortably pressure any Hero, or keep a team mate alive. What's particularly powerful about Eye of Horus is the fact it still allows Ana to be part of a team-fight, even if she isn't close by. Piercing Darts allows Ana to improve both Sleep Dart and Healing Darts. As a Quest Talent, if she completes both stages Sleep Dart can sleep two targets, while Piercing Darts can also hit two. Best of all, both gain a 25% range increase: it's exceptional for keeping Ana alive and allowing her to have value from afar. Variable: Although Ana can instantly heal a Hero for a fairly large amount, she cannot rapidly deliver healing to multiple Heroes due to her need to reload. Detachable Box Magazine is a quest talent that allows Ana to not only increase the damage of Shrike by 50% against foes with 5 stacks of poison, but it also provides an active ability. Once you've tagged 15 players with 5 stacks of Shrike, you can feed 3 rounds of Healing Dart into your rifle. Effectively, it allows you to instantly deliver 4 shots of rapid healing (1 in the chamber, 3 ammo fed after). It's a level of burst healing that surpasses all other Support Heroes. Best of all, the damage bonus is pretty awesome. Overdose isn't an exiting Talent, but does allow Ana to apply some team-pressure from afar. Use of Sleep Dart and Biotic Grenade now apply 2 doses of Shrike to those affected. Considering Sleep Dart can hit two players if you complete Piercing Darts, and Biotic Grenade being an AOE, it's fairly easy to affect multiple Heroes at once for a steady tick of damage. Most Heroes have some form of ability, so having the power to reduce it by 10% per stack of Shrike is huge. A 50% reduction against a Hero such as Kael'thas or Li-Ming, thanks to Mind-Numbing Agent, seriously hurts their damage potential. Best of all, your basic attack range ensures it's incredibly easy to maintain. Variable: Against a composition that has a very high damage dealer, such as The Butcher or Genji, it's worth taking Debilitating Dart. This active ability allows you to temporarily lower the damage and movement speed of the target by 50% for 4 seconds, ensuring whomever they do attack, takes far less damage. If you have a skilled "mage" in your team (Jaina, Kael'thas, Gul'dan, Falstad or Li-Ming), Nano Boost can be exceptional. It's also worth taking on Battleground's such as Battlefield of Eternity when you have Valla with you. The cooldown reduction and damage boost can allow her (or other ability based Heroes) to cut through an immortal at frightening speed. Against a stun-heavy composition, that includes Heroes such as Anub'arak, E.T.C or Uther, take Smelling Salts. The stun removal and bonus armor will severely limit their potential. Variable: Against a root-heavy composition that includes Heroes such as Arthas or Malfurion, take Purifying Darts. The root and slow removal on Healing Dart is incredible. Concentrated Doses provides a 10% bonus to Ana's healing based on each stack of Shrike. If you can maintain multiple, while reliably landing your Sleep Dart, you can easily obtain a 50% bonus, if not higher. Providing Ana with an instant Sleep against anyone who has 5 doses, Somnolent Doses is incredibly disruptive and allows her to kite, while also shutting down the majority of an enemy team. This list of tips and tricks are just a handful of things we think will help your Ana play. We'll continue to add to the list as required and if you have any tips you'd like to share, let us know in the comments below and we'll place them here. 1. Positioning is incredibly important for Ana. Be sure that you're always maximum distance away from your allies, and the enemy. 2. Try to regularly change positions so that you have sight-lines to land your abilities and attacks against allies and enemies. 3. Ana has an incredibly fast rate of fire, especially when stutter-stepping. Use this to stack Shrike quickly against multiple Heroes. 4. The Shrike dot will not break Sleeping Dart! 5. Healing Dart will pass through minions: there's no need to move if they're in the way. 6. Always change positions so that you can heal your front-line Warrior. Try to flank from the sides, rather than sitting immediately behind your team. 7. You have to wait 2 seconds between firing Healing Dart. Try to rotate who you heal, so that everyone on your team is topped up. Don't keep healing just one player (unless they're being heavily focused). 8. Try to complete your level 1 Quest as quickly as possible so that you can use Detatchable Box Magazine. The multi-loaded Healing Dart is riduclously powerful (I'd argue it's stronger than Ancestral Healing). 9. Biotic Grenade reduces all healing of enemies affected by its blast by 100%. Use this to shut down large heals such as Rehgar's Ancestral Healing. 10. If a team fight is going your team's way, use Biotic Grenade aggressively to ensure those at low health won't survive your push. 10. Remember that Biotic Grenade boosts the healing received of those affected by 25%. Use it first, followed by Healing Dart, on a target under heavy fire. 13. Sleep Dart has a slight delay before it is fired. Take this into account when aiming. 14. Sleep Dart has a huge cooldown (14 seconds). You honestly can't afford to miss. Go to the training room with unlimited cooldowns to practice your aim. 15. Eye of Horus is brilliant if you want 8 rapid shots of healing for your team, or to finish off low-health Heroes. Try to use it from a hidden location, as long as your team are giving you vision. Once your ammo is depleted, be sure to quickly rejoin your team.